Massie Tabb died. She was born circa 1914. Stella Mae Tabb married William Thurman Newsom. Stella Mae Tabb was born on 12 December 1910 at Pottawatomie County, Oklahoma. She died on 16 March 2003 at Shawnee, Pottawatomie County, Oklahoma, at age 92. 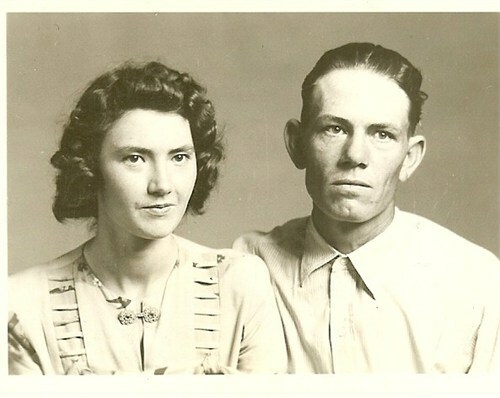 William Thurman Newsom married Stella Mae Tabb, daughter of Clarence Winfield Tabb and Minnie Flora Warren. William Thurman Newsom was born in 1911. He died in 2001. Edward Bachuss married Hazel L. Tabb, daughter of Clarence Winfield Tabb and Minnie Flora Warren. Edward Bachuss was born on 13 August 1909.1 He died on 4 March 1961 at age 51.1 He was buried after 4 March 1961 at Tecumseh Cemetery, Tecumseh, Pottawatomie County, Oklahoma. Mary Jane Rhea was born in 1903 at Texas; This info provided by Mayra Sneed Lopez of Oviedo, Florida on June 16, 2014. Her email address is: prp1455@aol.com. Henry E. Tabb was born in 1815 at Mason County, Kentucky. He married Frances Laura Bane circa 1838 at Mason County, Kentucky. Henry E. Tabb died after 1870 at Mason County, Kentucky. Frances Laura Bane was born in 1815 at Bracken County, Kentucky. She married Henry E. Tabb, son of Edward Tabb and Letitia (Luce) Ann Gill, circa 1838 at Mason County, Kentucky. Frances Laura Bane died in 1870. Martha A. Tabb died. He was born. John L. Tabb was born in 1838. He died in 1900. Sarah F. Tabb died. She was born in 1845. Erasmus G Tabb died. He was born in 1846. George Edward Tabb married Sarah Elizabeth "Lillie" Laycock. George Edward Tabb was born on 7 October 1851 at Mason County, Kentucky. He died on 17 March 1930 at Mason County, Kentucky, at age 78. Anna Tabb was born in 1887. She died in 1973. Charles Smoot Tabb married Leona Reese. Charles Smoot Tabb was born on 4 November 1881 at Kentucky. He died on 12 June 1954 at age 72. He was buried after 12 June 1954 at Augusta Hillside Cemetery, Augusta, Bracken County, Kentucky. Mary Ellen Tabb was born on 8 March 1915 at Todd County, Kentucky. She died on 23 August 1920 at McLean County, Kentucky, at age 5.